NASA's LADEE moon probe crashed into the lunar far side as planned on April 18, 2014, bringing an end to its $280 million mission. A NASA probe orbiting the moon will literally bite the lunar dust within the next week or so when it crashes into the moon's far side. The $280 million LADEE mission (short for Lunar Atmosphere and Dust Environment Explorer) was launched in September 2013 and is now targeted to plow into the moon's far side on or before April 21. Scientists are currently culling through a bounty of scientific data yielded by the spacecraft while also diving into several puzzling questions. LADEE researchers presented their early results during the 45th Lunar and Planetary Science Conference (LPSC), held last month in The Woodlands, Texas. Thanks to LADEE's low-orbit swings around the moon, the spacecraft has scoped out the moon's dusty exosphere. LADEE's Lunar Dust Experiment (LDEX) instrument has identified the dust cloud surrounding the moon, which is maintained by micrometeoroid bombardment of the lunar surface, said Mihály Horányi, principal investigator for LDEX at the Laboratory for Atmospheric and Space Physics (LASP) at the University of Colorado, Boulder. "We do have an atmosphere; it's made out of the dust particles," Horányi said of the moon. LDEX observations are the first to identify the ejecta clouds around the moon sustained by the continual bombardment of interplanetary dust particles, he reported. LDEX is expected to characterize in detail the ejecta cloud surrounding the moon, including the size, velocity and angular distribution of the ejecta particles, Horányi said. "Discovering this cloud … it opens up a whole new avenue to do planetary science," Horányi said. "If you are worried about safety, you better learn about these big particles." The transmitted data set from LDEX has identified "a whole forest of bursts," said Sascha Kempf, also with LASP. LDEX has churned out large amounts of data about the moon's dust exosphere, Kempf said, and deepened insight into the physics of the phenomenon. This photo of a low-level lunar horizon glow was snapped by NASA's Surveyor 7 lander in 1968. The white streaks are glows observed at different times. Preliminary data gleaned by LADEE also includes a look at China's Chang'e 3 moon lander's activities — specifically, the Chang'e 3's exhaust plume and its impact on the moon's exosphere and landscape as the craft powered its way down to Mare Imbrium (Sea of Rains) on Dec. 14 of last year. That work is still in the early stages of analysis said Dana Hurley, a planetary scientist at the Johns Hopkins University Applied Physics Laboratory in Laurel, Md. She is a guest investigator on the LADEE science team. At LPSC, Hurley said she estimated more than 980 lbs. (446 kilograms) of water was released during Chang'e 3's entire descent burn that took some 12 minutes. Her modeling suggests that nearly 270 lbs. (122 kg) of that water actually intersected with the surface of the moon. One benefit of this study, Hurley said, has implications for future moon exploration. If you're setting up a permanent presence there, with rockets coming and going, you need to know how exhaust from landings and takeoffs might come into contact with moon-situated instruments and equipment. 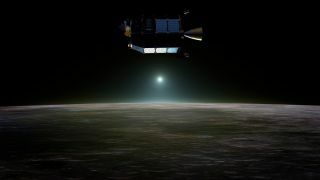 "One of the bottom lines of the investigation is that when a spacecraft lands on the moon, it produces a global but short-term perturbation to the lunar exosphere," Hurley told Space.com. Furthermore, because comets and meteoroids also bring water and other volatiles to the moon, "studying the propagation of the exhaust products by modeling the LADEE observations can inform us on how those volatiles may eventually migrate to the cold traps in permanently shadowed regions on the moon," Hurley said. LADEE data is being used to investigate the effects of China's Chang'e 3 moon lander touchdown last December on the lunar atmosphere and surface. Shown here is NASA's Lunar Reconnaissance Orbiter Camera view of the Chang'e 3 lander (large arrow) and rover (small arrow) just before sunset on their first day of lunar exploration. Even during its final days, LADEE is attempting to tackle a lasting question: Are electrostatically lofted lunar dust particles present within the moon's tenuous atmosphere? The scientific debate has been decades in the making. In the 1960s, some of NASA's robotic Surveyor moon landers took images of a twilight glow low over the lunar horizon persisting after the sun had set. After that sighting, several Apollo astronauts orbiting the moon spotted twilight rays before lunar sunrise or lunar sunset. Those sightings have given rise to the idea of levitated dust and the physics needed to support such an occurrence. NASA's Elphic said, so far, all LADEE has seen is dust that is consistent with a fairly steady rain of meteoroidal material on the moon's surface. Surveyor images from the lunar surface showing horizon glow just a few meters above the moonscape could be a completely different phenomenon than elevated, higher-altitude dust, Elphic said. "We anticipate that when we go really, really low with LADEE, and run the dust experiment, we'll put that to the test," Elphic said. In addition, by using a LADEE star tracker, an attempt will be made to mimic the Apollo 17 observations as the LADEE approaches orbital sunrise. "Hopefully, the star tracker will have enough sensitivity to actually see something," Elphic said. "I wouldn't be surprised if we don't … but it would be hugely exciting if we did." "From the reports I heard at LPSC, LADEE instruments appear to have detected temporary dust sprays thrown up by occasional small impacts on the lunar surface but see no sign of levitated dust," Schmitt told Space.com. Systematic, long-term dust levitation, however, and slight migration and redeposition of such dust, Schmitt said, would imply that there should be significant covers of very fine dust on rock surfaces. "But no such coverings of dust were observed by the astronauts who explored the moon on foot," Schmitt said. "We only observed and photographed scattered deposits of coarser debris thrown on the rocks by nearby meteor impacts. Most rock-exposed surfaces are clear of dust." Schmitt had a theory regarding the horizon glow that was sketched on Apollo 17. To him, it looked like what would be expected from a combination of a solar light diffusion along a long path length in the transient gases of the lunar exosphere — that is, nonpermanent atmosphere — and the zodiacal light and particle streamers emanating from the sun that can be observed just before spacecraft sunrise. "One of the many successes of LADEE has been to put a very low upper limit on the possible size and quantity of levitated dust," Schmitt concluded. LADEE's imminent demise is bittersweet, Elphic said. "We could have probably flown another month at least," Elphic told Space.com. "It would have been fruitful. But we originally signed up to complete our science in 100 days." LADEE was "fuel-rich" at the end of the 100 days, with NASA headquarters giving the mission an extra month or so on orbit before its purposeful crash into the moon, Elphic said. There remains a significant amount of work to be done, given the LADEE collection of information, Elphic said. The science team expects to have most of the fruits of their efforts done a year from this coming summer, he said. "We're moving ahead," Elphic said. "We've really only just started analyzing the data. With missions like LADEE, the more mature you get with the data, the more you find." Leonard David has been reporting on the space industry for more than five decades. He is former director of research for the National Commission on Space and is co-author of Buzz Aldrin's new book, "Mission to Mars – My Vision for Space Exploration," published by National Geographic. Follow us @Spacedotcom, Facebookand Google+. Original article on Space.com.